Wendell Berry, in his inspirational essay “A Good Scythe”, simply states, “Learning to [peen the blade] takes some effort and some considering”. He was referring to the traditional “freehand” method, which David Tresemer discusses briefly in The Scythe Book. Sharpening Principles represents my attempt at the considering; the theory is applicable to the peening of scythe blades in general. 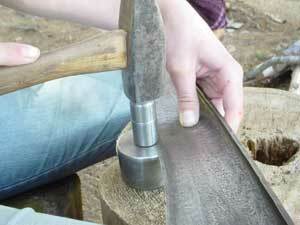 In practice, the freehand method takes patience and a good aim with the hammer. Fortunately, for the benefit of those who are either too hurried or without a good teacher, some tinkerers many decades ago invented various forms of a device to make the process easier and the considering less complicated. In English it has been referred to as the “hammerer of scythe blades”, “scythe blade sharpening device”, or “hammering apparatus”. I refer to it as “peening jig” or simply “jig”. Whether Tresemer was not aware of its existence or did not think it would be helpful to his mail-order customers I will never know. Perhaps he was extra-talented and fast with the hammer. Or perhaps he thought that in using the simplest tools possible lies a better chance of preserving one of the ancient skills. If the latter, that nostalgic part of me applauds him, for I personally am partial to the more primitive of the available methods. However, I have seen enough damaged blades “freehand peened thin” to now consider this jig an almost indispensable aid for the average novice. The primary advantage of the jig is that it compensates for inaccurately placed hammer blows. You will also effectively bevel a predetermined width of the edge without the danger of overreaching so the results will be far more consistent. In some parts of Europe it is customary to peen the blade still attached to the snath, and various methods of steadying the unit have been devised. I will not describe them here because I am convinced that, given the average setup, more accurate results can be achieved if the blade is disconnected from the snath. This takes only a few seconds and will also offer a chance to properly re-haft the blade, clean and occasionally oil the part of the snath that accumulates debris and moisture, and oil the threads of the set screws on the ring. One prerequisite is to set up a steady block of wood, preferably as least 30 cm/12″ in diameter, at which one can sit comfortably and work in good light. (The jig can be clamped in a vise, as indeed the instructions on the package suggest. I consider this a poor substitute, because few users doing it this way will take time to make an auxiliary setup to support one end of the blade while the opposite is being worked on. With a short blade it would not be as difficult; however, in attempting to steady one of 70+cm while its point is being hammered, some means of support will be readily appreciated.) My favourite way to steady the blade is shown in Figure 2–because the thighs can provide the most instant adjustments of any method I have tried. Figure 2. This block is 50 cm./20″ tall and the seat 10-15 cm./4″-6″ lower (not drawn to scale). The dimensions should be adjusted to the user’s comfortable position. 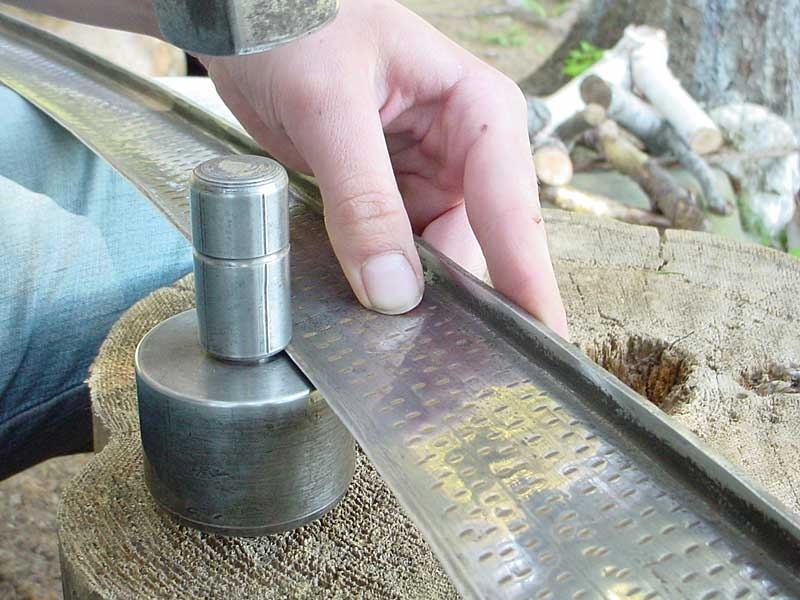 To set the jig into the block, it is recommended to pre-drill a slightly undersize hole. With the cap in place, tap it in carefully with a hammer until relatively steady; at this point you can insert the blade and get to work, and in a short time the base of the jig should contact the block. Alternately, without the cap in place, you may drive the jig all the way in with a piece of hardwood. The central pin upon which the caps rotate should never be struck with a steel hammer unless one of the caps is in place, as it could be damaged enough to prevent the smooth movement of the cap. It is also better not to hit the cap hard without the blade inserted; it will retain the shape of its lower end much longer if not beaten against the base itself. (During workshops/demos at a fair, I have seen children energetically hammering an “empty” jig just for fun.) The blade acts as an in-between cushion. The two caps are used successively and have differently-shaped bottom ends. The first will reach approximately 4mm (5/32″) from the edge. The second will flatten the metal nearer the edge and thus also move it a tiny bit outward. If the blade has been neglected–not damaged per se but used too long without peening–it may be necessary to repeat the step with either and/or both caps. If done at regular intervals, after perhaps four hours of mowing, you should not need to use the first cap every time. Before proceeding with the peening, there is an important and often-neglected step. It is the cleaning of the edge, at least the peening zone of 2-4mm. The process is described in detail here, albeit using a new blade. Use a piece of emery cloth, a Sandflex “Rust Eraser” block, or some other abrasive. Clean the edge until it shines, then inspect for damage which should be repaired before peening. For a discussion on this, refer the “The Scythe Must Dance”, pages 156-161 or click for the section on “Repairing the Damaged Edge“. The frequency of the hammer blows is synchronized with the speed at which you move the blade and the force used is nearly uniform throughout. The jig requires no specialized hammer. Any common one weighing at least 500-600g. will work. In cases of neglected blades and for bush blades, the heavier hammer will be more effective. I consider it better to use a heavier hammer gently than a lighter one too vigorously. In careful hands, even 1000g. is fine.However, the hammering can be overdone by striking too hard. Cracks can be caused and/or the edge made “wavy” like a piece of crepe paper, especially if the primary bevel is relatively thin (as will be the case with most new Austrian-made blades.) I believe that peening would more often produce better results if one concentrated on flattening the “back-bevel” instead of thinning the edge. (Back-bevel, as explained in Sharpening Principles is the “edge roundness” caused by the whetstone contacting the edge at ever-changing/inconsistent angles. For the first-ever peening session, you may want to make one pass over the blade rather gently to get a feel for the steadying, the rhythm and how the steel reacts. Then carefully check where the back bevel remains; perhaps mark these areas from the top with chalk and peen them again with a more gentle touch. 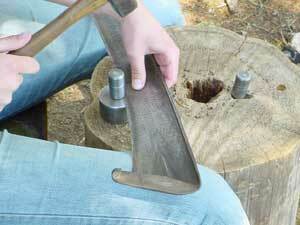 After this process, if the job was done well, the blade’s edge is correctly beveled but not actually sharp. This is because it runs against the central pin or shaft of the jig during peening, and this of course dulls it. Examine the blade edge on, and notice the light reflecting off the edge. Move it slightly sideways back and forth until you find an angle where the reflection is greatest; at no time during use should it reflect light along more of its edge than at this stage. Any edge tool can be deemed too dull for many of its tasks if the average person’s eyes easily detect this reflection while the edge is held to good light. It will now be understood that no more pressure than necessary should be applied with the blade against the jig’s pin when peening. Accordingly, more work with the whetstone will now be required to ready the blade for cutting than during a honing break in the field. A synthetic stone will accomplish the first part of this task much faster. (In fact, a fine-grit natural stone can be so slow that before the edge is truly keen, some “roundness” has returned to the bevel. 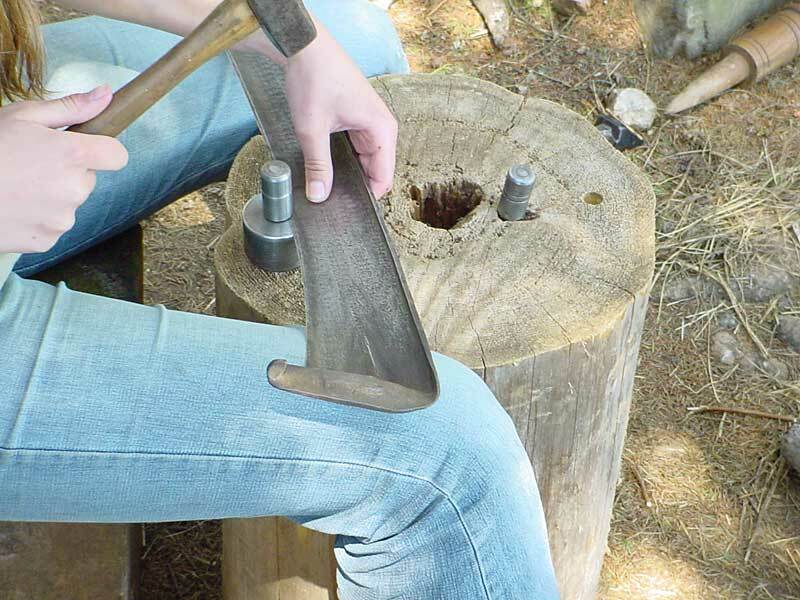 If you own only the natural whetstone, do this step with a carborundum bench stone or 120-grit emery cloth fastened to a small block of wood) I suggest that this is done in some comfortable and steady position before mounting the blade on the snath. I hone first from the top, holding the blade by the tang with my left hand, with its point against a block of wood, diagonally across in front of me while I kneel on the ground; try other positions if you wish. 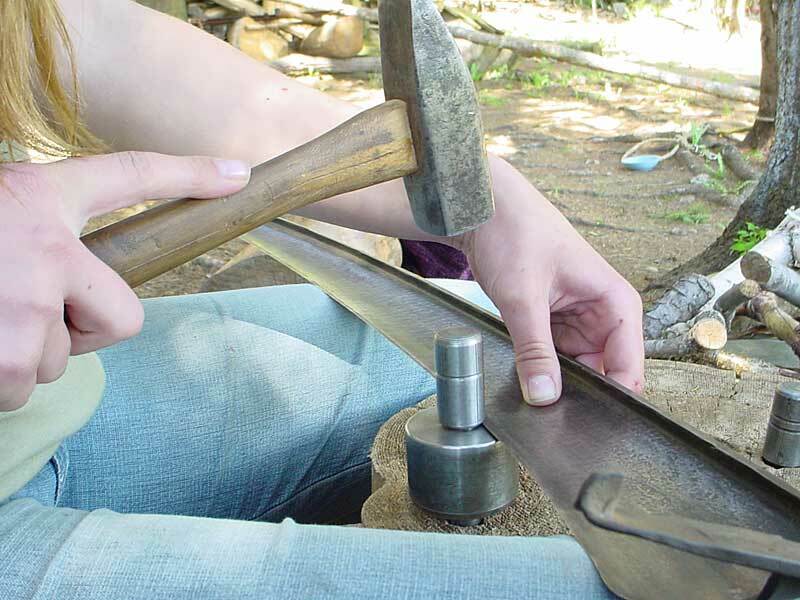 For this task of honing the blade from the top when off the snath, use the stone on its narrow edge (Figure 5). Most whetstones have a shape that corresponds somewhat to the curvature between the slightly upturned edge and the back rib of the blade. Used on their convex edge, one can achieve a lower bevel angle if desired. As has been explained, doing so offers a more penetrating profile but also increases vulnerability. The true bush blades, for instance, are better with a less acute secondary bevel and should be honed steeper than the rib-to-edge relationship. (Figure 7). If the rib is used as an angle guide, the stone should barely contact it and the pressure be focused on the edge. There is no direct harm in rubbing both rib and edge equally hard, should you find it easier at first, other than needless wear on the stone. Repeat these steps using a natural stone. Smooth-cutting edges are achieved through the use of abrasives of a rather gentle nature. Most synthetic whetstones available today do not belong in this category. All sharpening stones function by cutting grooves in a steel edge. The larger, harder and/or more angular the abrasive particles (i.e. the grit), the larger the grooves. The inevitable side effect of this process is that some pieces of partly-cut-off steel remain attached and protrude over the edge. These constitute the so-called “burr”. Most will be bent away from the direction the stone travels. As the stone is applied to the opposite side, some of the burr is bent back. This game could continue “forever”, for even as some burr breaks off, more is created by the grit of the abrasive. (The coarser the stone the more this is true.) Someone without much sharpening experience testing an edge may feel the individual teeth comprising the burr grab the skin of their thumb, and the tool would seem deceptively “sharp”. In reality, these teeth should be considered a nuisance or at best a temporary condition at a certain stage of the complete sharpening process. The purpose of the final honing, therefore, has always been to remove the burr as completely as possible. The popular opinion that serrations along an edge are desirable is a half myth. The objective of creating serrated edges on some cutting tools during the process of manufacture is to reduce the need for the usual frequency of sharpening. A serrated knife may indeed work very well when new and still cut several years later without having been sharpened. But a distinction must be made. Its relatively sturdy teeth are the result of deliberate specialty edge shaping by the manufacturer and are designed to stay there for the life of the tool. The type of teeth we are concerned with when discussing scythe blades are short lived. At best, some of the smallest and best-aligned ones wear off gradually. Most often, a percentage bend over or break off during the first few seconds of use, leaving behind a flat, light-reflecting surface, in other words a dull edge at that point. The coarser the stone used, the wider this blunt surface and the less keen the edge. There is no doubt that edges well finished with finer stones cut easier and smoother; the burr, being smaller and protruding less, will not bend over or break off as soon. 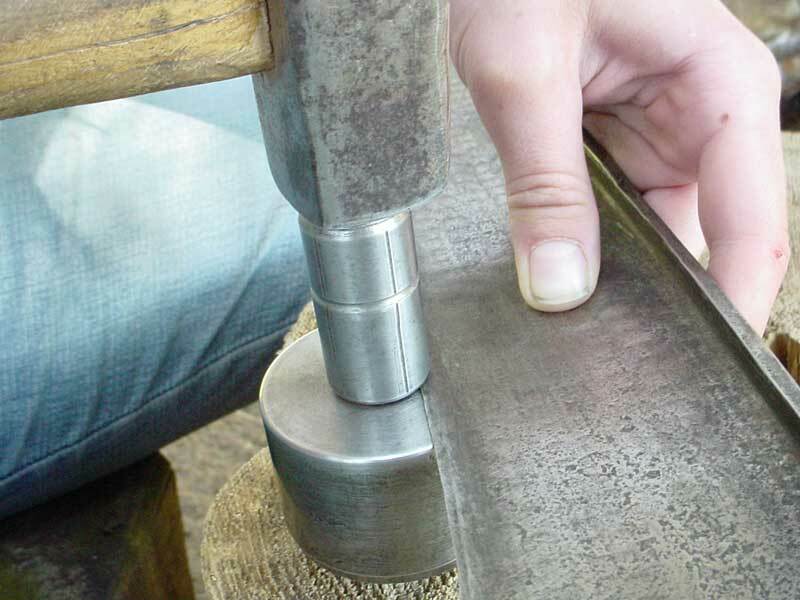 As was explained in Sharpening Principles, the whetstone starts altering the “ideal” penetrating profile of the edge from the first whetting on. The variables affecting the time interval at which re shaping is advantageous are therefore related mostly to how the blade is honed. I nearly always use fine-grit natural stones and hone about every five minutes. Mowing in a field where only an occasional rock is found, I peen approximately every 3 to 4 hours. If I used the kind of synthetic whetstones prevalent today, I would halve that time interval. In many European traditions, 4 to 6 hours was “a day’s worth of mowing”. During “lunch break” (around 7 or 8 AM) the blades were often touched up with the hammer. Only those who made a seasonal profession of mowing could be found in the field during the dry, toilsome afternoon hours. Those who could afford to own two scythes would swap halfway through the day; both had been readied the evening before. In view of the above, and from my own experience, the intervals of 15 minutes for whetting and 12 hours for peening recommended by David Tresemer are exceedingly long. Even if I were a strong man, I would consider it a poor expenditure of energy to coax a blade, maintained on such a schedule, through the grass. Perhaps I am lazy, or simply like to hone and hammer scythe blades…mowing is a very personal experience. The time taken to complete the task of peening would not concern me at all. The quality of the results is directly related to patience and attention to details. Using the jig, it may be accomplished in about 10 minutes – five minutes per cap; with experience one may halve that time. I prefer the “freehand” method, and after hammering many dozens of blades, still take 15 to 20 minutes for one of average length. It is my very enjoyable centering period of a summer’s day. There is also a substantial difference between peening a blade that has been neglected, i.e. left unpeened too long, and just “touching up” a well-maintained one. Tresemer’s diagram (page 22 in The Scythe Book) suggests what I’d refer to as the “four lines” method of peening, which is a more-or-less “complete” job. I would never advise this to beginners. One or two lines, repeated at more frequent intervals, would certainly produce far more satisfactory results. With other words, if someone wants to spend only five minutes to peen a 70-cm blade they should do one line of slightly overlapping strokes. I do this myself occasionally – and yes, I can do that in five minutes. Until more extensive notes are in print, I will leave you with one suggestion: Practice the peening on used “American” blades. They can often be obtained for a few dollars and may save your good blade from initial abuse. I have yet to come across one that could not be peened; some, in fact, cold-work better than many blades of recent production. An inexperienced person may crack one (which in itself is a good lesson and a chance to practice edge repair), but not because the blade is too hard. Rather, they will be found with edges too thick and convex from both sides, and may crack or chip if struck while not well supported. Filing the bevels thinner and flatter will help. And always, for Heaven’s sake, remove ALL rust from both sides of the edge you are about to peen. The jig, like all tools you care about, should be kept free of rust. If you keep it set in a stump in the backyard all summer, by all means cover it with an old can or bucket. A light coat of grease or oil will help. The oil also keeps the caps moving smoothly as they should when peening. With a little care, this simple tool will last for decades. 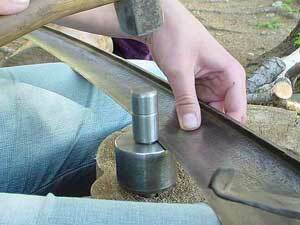 A few close-up photos of peening a blade; click each one for a larger image. Poor technique–the edge is not supported.